My Two Schillingsworth: AZSF: Hawes Beerduro!! Stop number two on the 2013 Arizona Spring Fling (AZSF) led me to a post-work evening night ride out at Hawes. This would be no ordinary Hawes ride, there's a twist here. 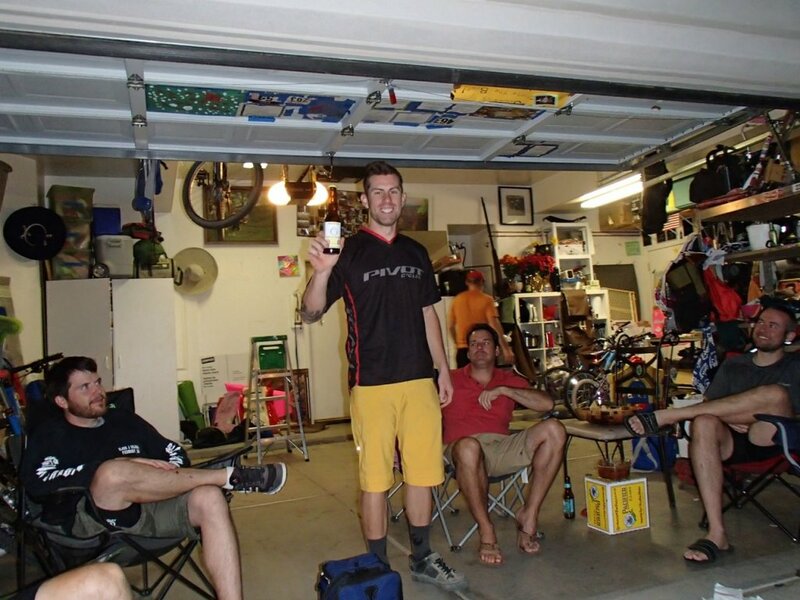 Combine an enduro format with beer chugging and what do you get? 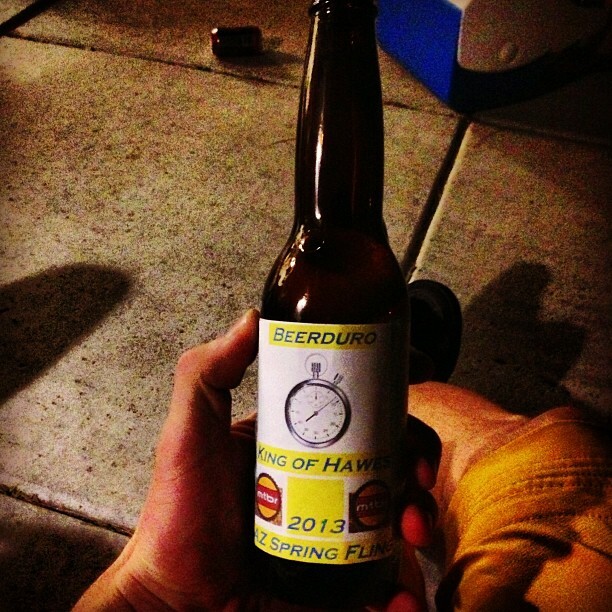 Hawes Beerduro!! Here's how it works: Pick a few segments of trail that are timed segments. Coordinate stopwatches, start each rider about 30 seconds apart and record the time through that segment. Ride at a social pace to the next segment. 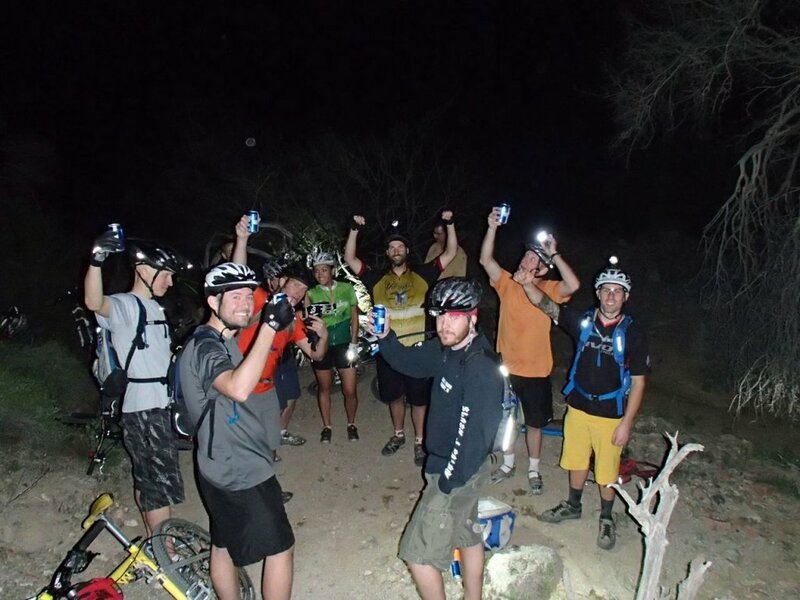 Total your ride times for the segments, then proceed to the ultra-secret beer bush to get timed on chugging a beer. Multiply that beer time by 10 for a little field leveling & add it to the ride time totals for the grand total. Who would be the inaugural champ? We met up at Shawn's house, where he and Doug, would be the keepers of the clock. A few more people showed up and we were off to the top of Hawes for segment #1. How exciting!! 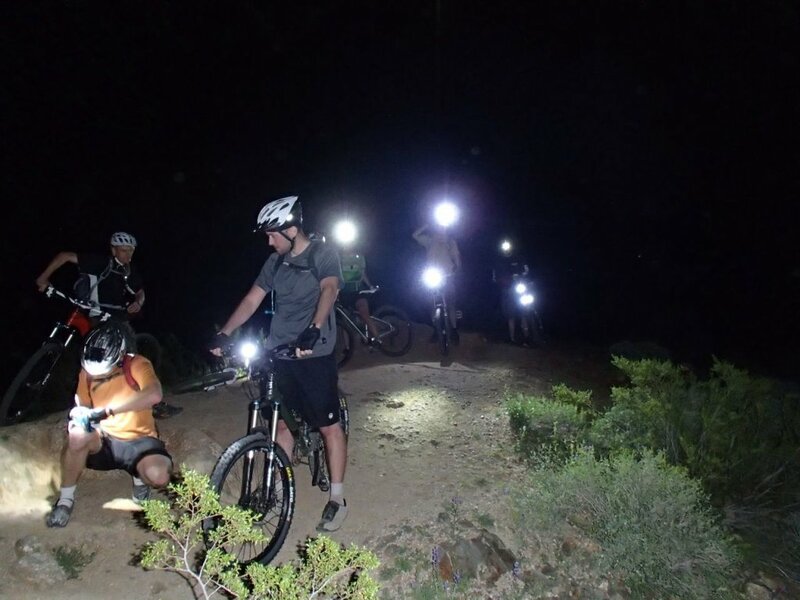 I think we had 8 riders total, ranging from downhill to first time ever riding at night, should be interesting to say the least. Doug went first since he had to setup the timer at the bottom of stage 1. Dennis lines up for segment #1. I snapped a few pics of the others taking off then lined up for my run down Hawes into the Disnyland section (a fun twisty downhill boulder dashing segment). Immediately after starting I noticed how much more rutted/choppy upper Hawes had become. It caught me a little off guard as I almost T-boned a couple a Volkswagen Bug sized boulders!! Back on track and hammering (by my standards) I was approaching the main descent when a hiker & his three dogs (one loose) were off to the side of the trail. The loose dog, a medium sized Rott or something, came close to me, did an about-face and bit me in the leg!! WTF!?!? Thankfully it wasn't a full-on chomp, but a good scuff as I could feel the teeth on my skin. I yelled back at the hiker to control his dog and kept moving, after-all this was the Beerduro! It couldn't have been more than 30 seconds later near the bottom of the steeper section when I heard that all too familiar noise of a rubbing brake spring!! Nooo, not again! I had a similar fate during the AES McDowell 60 back in December, I recognized the sound all too well. This time it was my front brake spring and it was mangled beyond repair. Beerduro 2013 = DNF. 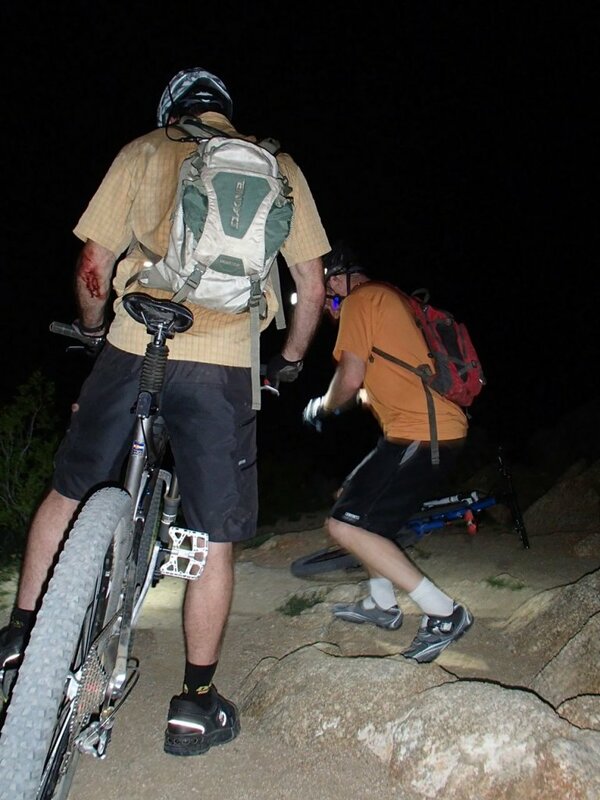 Barely 1 1/2 miles into the ride I wasn't about to bail back to the car, but I also wasn't keen about attempting a rear brake only descent down the Mine Trail in the dark. I removed the front brake pads and picked my way down Disneyland, then up Secret to find the group assembled for the start of stage #2. Rider up! Start of stage #2. Spencer was a trooper, first night ride, lights taped to his bike and he had a blast!! Well played sir! Our fearless leader for the event. I followed the group over to the Mine split, then meandered around to the Ridge Trail where I watched the lights dancing high above the desert floor. I spotted a couple pair of lights out on another part of the trail, night riding is so cool. This night taught me a couple of things: 1. I rely on my front brakes A LOT & 2. My rear brakes don't work as well as I thought they did!! 3. I really need to service my bike more frequently. 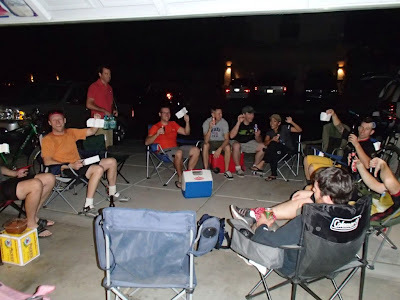 After a few white-knuckle moments I relaxed down at the beer bush waiting for the group to arrive. Start of stage #3: Mine Trail descent. Photo by Walt. Dave met a few trail gremlins along the way. Photo by Walt. They started arriving fast & furious, each whooping it up for the other over the final push. Look what they brought, four more riders to the party!! Walt, De, Dave & Aaron came for the beer!! We all took turns slamming a beer, mine was pretty pathetic for an ASU grad!! Did college life teach me anything?? The 'new' group in party mode at the beer bush! Photo by Walt. The final numbers were tallied and we made our way back to Shawn's for the award presentation gala. Dennis knocked it out of the park, winning by a 3 minute margin! Way to kill it!! Hold a Beerduro in your neck of the woods! Photo by Walt. Shawn presents the 'trophy'. Photo by Walt. 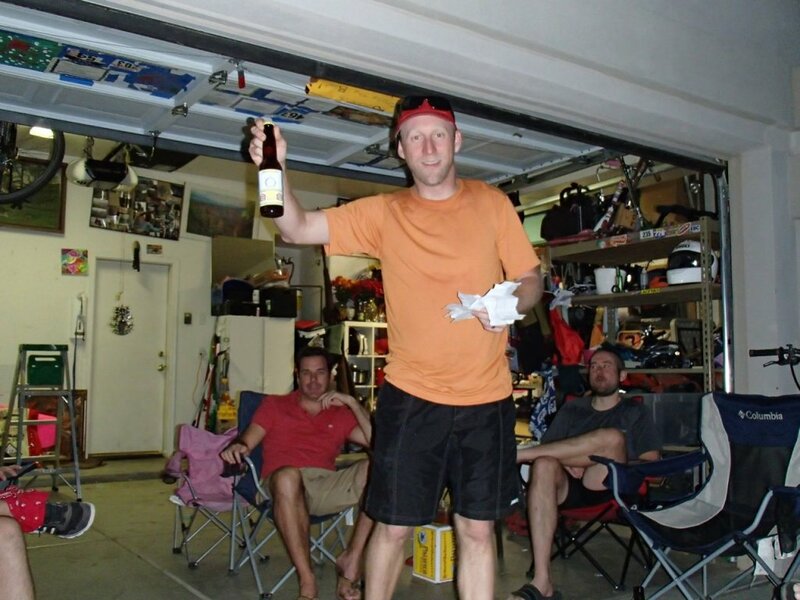 Win the Beerduro, sell the bike. That's how Dennis rolls. Photo by Walt. Cool trophy for a deserving winner. Photo by Dennis. This is what the AZSF is all about, organize a ride, meet new people, ride and have fun!! Thanks to Shawn and Doug for putting this one together, a DNF never felt so good!!. 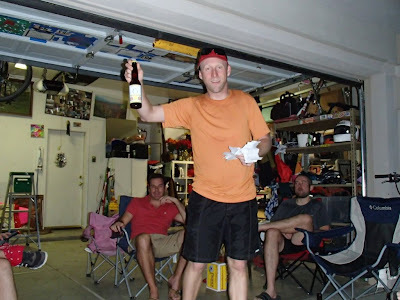 On a side note: I was to host a Spring Fling ride early the next morning, but was now without front brakes. Doug offered up a bled pair of Hayes brakes for me to use. We stopped by his house afterwards, swapped out the brakes and I was back in business. Thanks Doug, I owe you one!! More on that ride in the next post.